Worldwide icon-chevron-right North America icon-chevron-right United States icon-chevron-right New York State icon-chevron-right New York icon-chevron-right Circa Brewing Co. Photograph: Teddy Wolff Circa Brewing Co. Photograph: Teddy WolffCirca Brewing Co.
First, you notice the machines. The hulking, stainless-steel fermentation tanks are showcased at the entrance of this microbrewery from Gerry Rooney (Putnam’s Pub & Cooker). 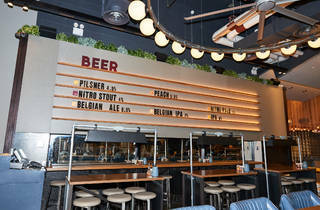 They are more savvy than steampunk, with the largest pieces hidden behind floor-to-ceiling glass windows for the kind of intimate transparency usually only seen on brewery tours. 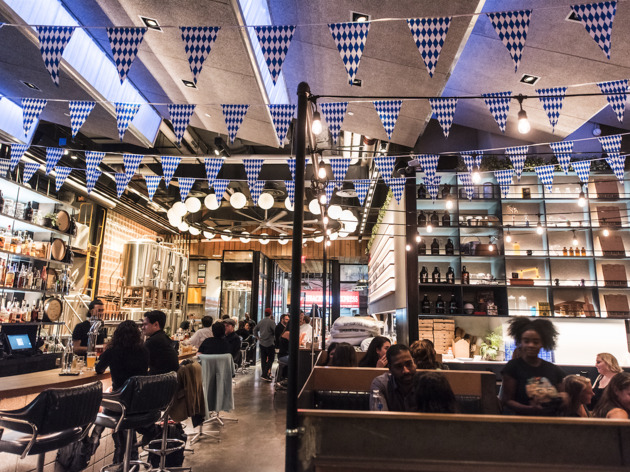 Add the blue-and-white bunting strung alongside dangling Edison bulbs and the salumi pizza served with grilled cauliflower steak, throw in a shuffleboard table, and you’re in hipster Brooklyn’s industrial version of a German biergarten. (Brookgarten has got to be a thing, right?) 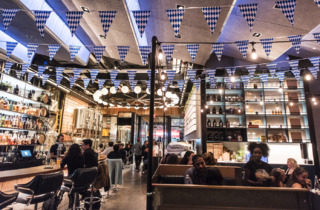 It makes for a bar that’s, well, wunderbar. 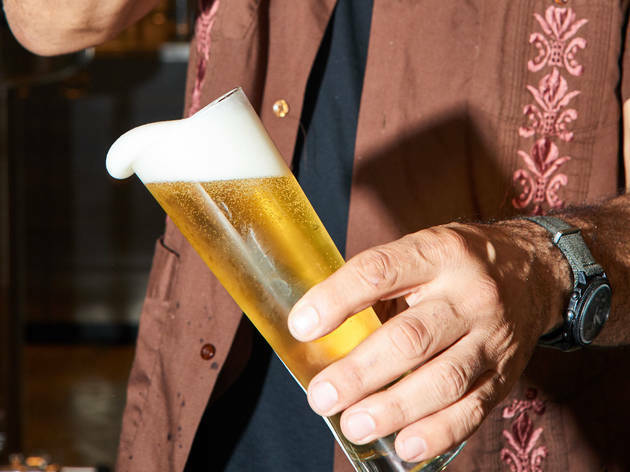 ORDER THIS: Head brewer Danny Bruckert (Sixpoint Brewery) has developed a small but mighty list of 10 brews rotating in and out, which can be served in pints or four-glass flights ($16). The fruity berliner weisse ($7) is evocative of a sour cider with a wheaty aftertaste, while the earthy pilsner ($7) goes down light and herbal. 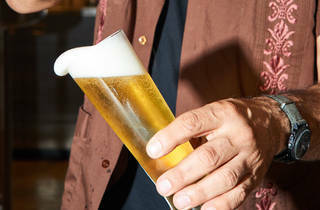 For something a little heavier, the Belgian wit ($7) contains strong spiced-cinnamon notes, and the hoppy New England IPA ($8) has a taste-bud-rollicking IBU (International Bittering Units) of 65—compared to, say, Harpoon’s IPA of 42—but still remains smooth and drinkable. The nitro stout ($7.50) is the espresso martini of beers, with syrupy coffee and chocolate notes, a sweet end to a flight. GOOD FOR: Making new friends. Sure, you could be part of one of the gazillion parties gathered here on weekends, but how much more fun is it to travel solo and join the fetes? 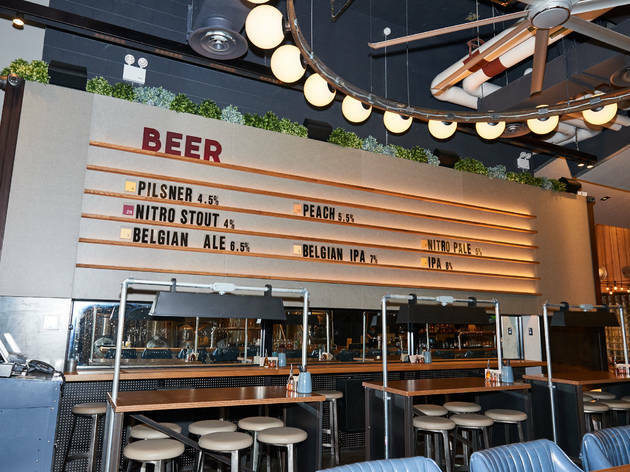 The 6,000-square-foot space with communal tables allows for plenty of mingling, especially with those tipsy party people who have lost track of their group. 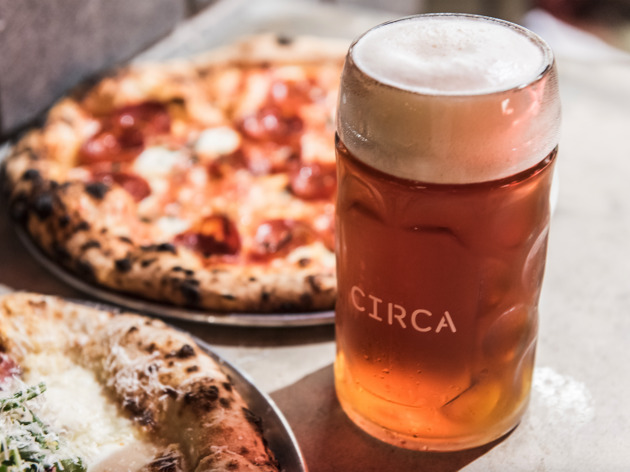 THE CLINCHER: It’s no coincidence that the flip side of the beer menu contains eight pizzas (in addition to fries and cheeseburgers) from Bruckert’s twin brother, Luke (Little Oven Pizza in Portland, OR). 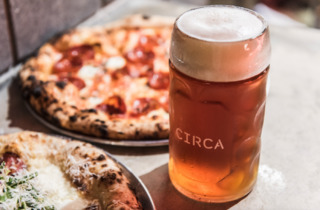 After a few pints, you’ll want to soak up the booze as well as the ambience, and those 12-inch pies, like 2 Cows, a Sheep & a Goat (mozzarella, robiola, coppa, greens; $20) or ’62 Hawaii (sweet onion, bourbon ham, charred pineapple, aged provolone; $18), are tasty even without beer goggles.